The 261-acre Bonham State Park falls within the northern extent of the Blackland Prairie, an area marked by grasslands interspersed with woodlands, near the Oklahoma border. 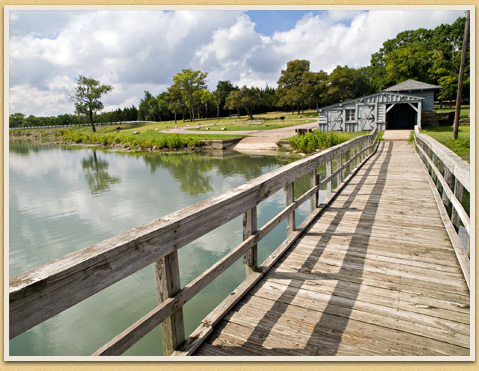 The CCC developed the park, landscaping the rocky, hilly terrain for erosion control and recreational purposes, and constructing an earthen dam to impound a sixty-five-acre lake. Politically significant at the time of its development was the proximity of the park to Bonham, hometown of powerful Democratic Congressman Sam Rayburn, who became Speaker of the House in 1940. Comprised primarily of Oklahoma enrollees, CCC Company 894, constructed buildings of local cream-colored limestone and Eastern red cedar, working under supervision of Bonham architect Joe C. Lair and San Antonio architect William C. Caldwell. The overall design exhibits a rustic style. Entrance Portal, Concession Building (currently the park headquarters and storage facility), Waterfront Storage Building (currently the boat house), Shelter and Dance Terrace, Picnic Tables, Barbecue Pits, Water Fountains, Vehicle and Foot Bridges, and Culverts. The Water Tower, currently in disrepair, is closed to the public.